In this busy season of artisan fairs and holiday bazaars, it seemed the perfect time to explore how members of Boston Handmade got their start in the world of DIY. From growing up in 'arty' families to discovering abilities as adults, crafting is an integral part of our lives! hours spent cutting out paper dolls. 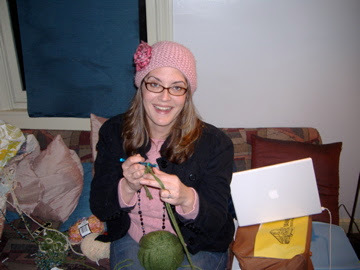 By around 9 years old I was trying to figure out knitting, crochet, embroidery, mostly from books. By High School, the crafting was something I did while figuring I'd go to Art School and do Real Art. Luckily, once in college I was able to see the scope of the serious craft world. I've been lucky- crafting all my life! Much like my childhood filled with latch hook rugs and woven pot holder kits that paved a very winding road toward vintage jewelry design, Allison Fraske (Fraske Design) has been creating art through changing mediums since she was "old enough to hold a crayon": I always knew that I wasn't going to outgrow my creative streak as some children do. As I aged, my medias changed. Hotloops were where it was at for a while. Then once I started reading teen magazines, I would tear out the pages and make collages for me and my friends. I discovered photography in high school and fell further in love with it in college. All the while, I was honing my technological skills, and I think that is a brief history of why I LOVE mixed media! Katy tell us: At age 6, for Christmas, I got a tiny sewing kit. (For the next 20 years I sewed only by hand hand...I even made flamenco costumes for myself by hand.) I just happened to have parents and grandparents who loved to feed my creative ambitions, so while growing up, I was always provided with creative tools: markers, pastels, fabric, a piano, paints galore. Grammy helped me create home-made patterns (and taught me good sewing habits). In college I discovered that there's nothing you can't do with needle-nose pliers, baling wire, duct tape, and a pile of beer cans (not for drinking, for making stuff, geez!). And after college, it was theater productions, and I was often that girl that was called backstage for the odd sewing job, despite the fact that I was actually there to participate in the show. Then one day...a magical arrival: a sewing machine. Again, my mother sending me a fabulous creative tool. Can't believe it took me 20 years to get my hands on one... but WOW... life-changing, and that's when the handbag creating began. Looking back on all of this there's two things to point out: just because you haven't taken an art class (I never did) doesn't mean you should ever hesitate to create. And nothing beats the support of family and community. I know not every creative person has this and I really count myself lucky that my family never told me not to create. Beth shares: I never sewed anything or had any ambition to learn. I was a later in life child so almost every Friday night my Nana would pick me up and take me to her apartment in Riverside, RI. We would hang out and I would watch her sew and make afghans for the grandchildren. Again she never taught me how to sew. She was a second mom to me and I adored her. When she past away from routine surgery, the family gave me her singer sewing machine in a desk with all of her notions, fabrics, basically everything sewing related. They said that it might inspire me to make something. Well it took another two years until I learned to sew and I have not touched her machine......yet. I feel that she is a part me when I sew and that she helps me. You have no idea when ever I make something that I think is pretty difficult and I'm basically self taught and I make it with no problems. It's a great feeling don't get me wrong! I think she knows how much I love to sew and maybe it was her dream to make a career with it and she helps me to make it mine. Betsy Baker, our talented modern jewelry designer shares her tale of artistic discovery as an adult: "As a baby boomer, I grew up at a time when artistic talent wasn't nurtured unless it was patently obvious. Even though I never took any art classes, I always liked working with my hands and dabbled in all sorts of things. But it wasn't until I was in my forties that I realized that all these hobbies were just my creativity trying to tell me to slow down and smell the roses. My artistic talents finally found a home in polymer clay. The depth and versatility of this humble plastic constantly surprises me. Although I had my artistic epiphany later in life than most, I'm making the most of it, having left the corporate world to concentrate on polymer art and jewelry design." Whatever the inspiration, it's clear that Boston Handmade's members are destined for greatness! Betsy, that's part of what drove my mom to be so supportive of my artistic sparks...she didn't have a whole lot of support in that regard when she was young. It's so wonderful that you found the spark and the drive later on :) !! !